Take these facts into consideration about the importance of installing fire extinguishers. When a fire starts, you want to make sure you are prepared to deal with it. In the case of a devastating fast-spreading fire, you need to have an evacuation plan in place and ready to go in case you have to evacuate your home or place of work. If a fire is more contained, you can prevent a great deal of damage if you try and put the fire out as quickly as possible before it can spread and harm you. The best way to do this is by using fire extinguishers to eliminate the fire. Every home and business should have functioning fire extinguishers at the ready because they are an important tool in fire protection. Take these facts into consideration about the importance of installing fire extinguishers. Fire extinguishers are one of the best devices to use in the event of a fire. If a person is properly trained on how to use fire extinguishers, then they are most likely to be able to put out the fire before it can spread elsewhere inside a building. In fact, in 80 percent of cases, fire extinguishers used by a properly trained person will successfully put out fires before they are out of control. When using a fire extinguisher it is important to remember The PASS technique. 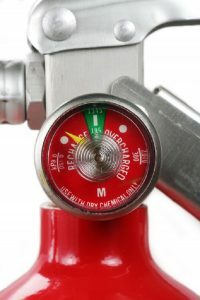 P – Pull the pin out of the extinguisher to break the safety seal. A- Aim the extinguisher at the base of the fire. S – Squeeze the fire extinguisher handle. S – Sweep the fire extinguisher nozzle from side to side to cover the base of the fire. Sometimes water cannot put out a fire. While water is a traditional method for extinguishing fires, , there are certain types of fires that will not be extinguished with water. And on some types of fire, water is dangerous. For example, one of the most common fires you will see in a kitchen is a grease fire, in which case water will not be effective in extinguishing the fire. This is why it is so crucial for the proper type of fire extinguishers to be a part of every kitchen that are capable of dealing with grease fires. It is unsafe to use water on other types of fires such as chemical fires and electrical fires. These fires require special types of extinguishers like CO2 or Clean Agent extinguishers. Always have a fire protection professional assess the area to identify potential hazards and the necessary fire extinguishers needed. This entry was posted on Wednesday, August 8th, 2018 at 5:46 pm. Both comments and pings are currently closed.